This piece is shared through Milford Irvin’s niece, who gave it to James Linn.Milford Irvin was one of those that helped create the story. The historical summary of Avis and vicinity which follows was written with two purposes in mind – to give a few high school students the practical experience of finding out how history is actually written, and to familiarize the local residents, and others who may be interested, with some historical high spots connected with the growth and progress of this community. There are many apologies to be offered. The information, gathered from the sources listed, will probably be lacking in certain minor details. Evidence, such as was used in the preparation of this paper, cannot be considered entirely authentic, and yet an attempt was made to disregard all information not thoroughly clear or substantiated with reliable facts. A full measure of appreciation must be extended to all those whose names appear on the reference list for their time, effort, and material so necessary in the preparation of this history. 1.Miss Priscilla Hamilton, Avis, PA.
2.Mr. Matthew Hamilton, Avis, PA. An old deed dated August 15, 1779; issued to John Hamilton, oldest son of Captain Alexander Hamilton, by the commonwealth of Pennsylvania, leaving him in trust of the land purchased from the Indians for Alexander Hamilton’s heirs. Correspondence - Henry W. Shoemaker, Harrisburg, PA.
2.“Otzinachson” - History of the West Branch Valley, by J.F. Meginness. Published by Gazette & Bulletin Printing Co. Pages 22-24, 33, 49, 97, 160-163, 168, 171, 173- 177, 205-206, 216-218, 220-222. 1.Mr. George Gabeline, Avis, PA.
2.Miss Addie Smith, Avis, PA.
4.Mr. James Nichols, Avis, PA.
5.Mr. J. R .Heller, Avis, PA.
6.Mr. George W. Emory, Avis, PA.
7.Mr. Roscoe Schlesinger, Avis, PA.
8.Mr. And Mrs. William Ruple, Avis, PA.
9.Mr. William McKinney, Avis, PA.-Copies of Newspaper-“Avis Advance”-July 1, 1905; August 4, 1905. 10.Mr. G. W. Swartz, Avis, PA.
11.Mr. Martin May, Avis, PA.
Before the white man came, all the land surrounding the Susquehanna River belonged to the Indians. However, it was not in their possession long, for on September 3, 1700, they deeded the River and all the surrounding territories to William Penn, this being the first deed granting any land around the forks of the Susquehanna. The Indians were granted permission to still live and hunt there. In the year 1712 this immediate section of Pennsylvania known as the “West Branch Valley” was divided into five nations of Indians: Mohawks, Oneida, Onondago, Cayuga, and Seneca. Late in the same year the Tuscarora Indian Tribe from North Carolina was adopted into this group making six nations of Indians. Another tribe also inhabited this section but was not included as one of the six nations. They were a war like tribe called the Monseys, who built an Indian Town not far above what is now known as Lockport. A second village, called “Patterson’s Town”, was located across the river opposite the mouth of Chatham Run. These towns were found by white settlers upon their arrival in this section. When the white settlers came the Indians believed that the land was for the benefit of all, and received them with kindness and friendly gestures, but the white man came to cheat the Indians and to take their land. This changed the attitude of the Indians, causing a hostile feeling, which later became a great hindrance to the white settlers. In those early days many adventurous young men set out to explore these new regions, among whom was a Frenchman, Etienne Brule, who is said to have traveled down Lycoming Creek and explored this valley in the year 1718. More Frenchmen from the Great Lakes entered the West Branch Valley in considerable numbers before the English came. With the arrival of the English, a very brave explorer named Conrad Weiser traveled through the valley, made friends with the Indians, and built the first house at Shamokin, Pennsylvania. Later, in 1765, a number of men from Cumberland went up river to kill all the Indians they came into contact with. These people were informed of the danger of the Indians, so they quickly gathered their belongings together and fled up the river. In 1768, following the purchase of land, a disagreement arose between the Proprietary Government and the Indians as to whether the creek flowing into the West Branch of the Susquehanna River, and called in the deed, Tiadaghton, was meant for Lycoming Creek or Pine Creek. The Indians said it was Lycoming Creek, but the Proprietors, or the British, claimed Tiadaghton or Pine Creek to be the extent of the purchase. In order to prevent any trouble from arising over this dispute it was decided that no one would be granted rights to any land west of Lycoming Creek. This decision did not prevent adventurous pioneers from making settlements within this disputed territory. The settlers who were classed as outlaws by the British had to come to agreement for their own protection. This resulted in an organization known as the “Fair Play Men”. They met when trouble arose and a court tried the cases. If one of the settlers refused to abide by the laws of the organization, he was placed in a canoe, with food, and set adrift down Lycoming Creek. The Fair Play Court was made up of three commissioners, and when they heard a case and made their decision there was no appeal. A party of surveyors traveled up the West Branch to the Great Island in 1768. Their purpose was to survey the Allison Tract, located on the west side of the Great Island on what is now known as Lock Haven, Pennsylvania. With this party of surveyors was a man named William Dunn. He was the hunter for this party, supplying it with wild game. His gun and equipment shone brightly, and attracted the attention of the Indian Chief who wanted to possess them. He wanted them at any cost so he offered to give Mr. Dunn the entire island in exchange for a rifle, trapping equipment, and a keg of whiskey. Mr. Dunn, realizing the value of this deal, accepted this offer and the Great Island became his possession. The Indian drank the whiskey, and soon after realized what a terrible mistake he had made. He had lost the Indian Settlement and the hunting grounds of his tribe. In true Indian fashion the Chief wanted to trade back, but Mr. Dunn held fast to his purchase. In 1760 a law was passed which prohibited any hunting of wild animals on land that was not bought from the Indians. Another law was passed on February 18, 1769 prohibiting the surveying of the land, or marking and cutting down trees on land that was not purchased from the Indians. The penalty was five hundred pounds and twelve months imprisonment. These laws, though strict, and intended to deal fairly with the Indian, proved no barrier, and men brought their families into this disputed territory, and set up their homes. It is said that Michael Quiggley made a settlement in 1762 on the Great Island just a little east of the present Lock Haven. It was there that his daughter was born in 1763. He then returned to Lancaster County, but came back again in 1768 and settled in what is now known as Wayne Township, Clinton County. He is believed to be the first permanent white settler in the county. Other early settlers who disregarded the laws of the Proprietary Government were as follows: William McElhattan, who settled in 1771 on the south side of the river on a stream of water, and at the site of the town that now bears his name. Another important character in the lives of the settlers of this section of the valley was Alexander Hamilton. He was of Scotch descent and came from Cumberland County which then comprised a large part of Pennsylvania. He came to the site where Lock Haven is now located, in 1772, and purchased 216 acres of land from the Indians there. In the same year he sold his land to Mr. McMeans for continental money, and moved down the river, with his family, to the bottom lands. With a few presents and good will he then procured land from the Indians, obtaining a section one mile fronting the river, and running back over the hill one mile to the site where Avis is now located. When John Jackson came from New York with his wife, Alexander Hamilton gave him half his tract, believing he had too much for him and his family to handle. Located opposite the present site of Pine Station, Clinton County, a portion of that land is now in the possession of Captain Alexander Hamilton’s descendants, who resides in Avis, Clinton County. Other early settlers included Thomas Nichols who settled in 1774 near Pine Creek; Francis Clark, who settled a short distance from Jersey Shore in 1774. Exact dates of arrival and settling are not known for the following: Hugh White, Alexander Donaldson, John Clark, Adam Carson, Peter Pentz, James Crawford, John Phoutz, Robert Love, Samuel Horn, William Campbell, Henry McCracken, SimonKurtz, Peter Grove, Hugh Nichols, Adam Dewitt, and Robert Covenhoven. More and more settlers moved into this land and on September 20, 1773 a proclamation was published to order these settlers out of this unpurchased and disputed land. This was disregarded, as were the other proclamation, and the settlers continued to locate in this section. In a few years the colonists began to rebel against the proprietary rule of Great Britain. Tremendous taxes brought quick objections and protest. A Committee of Safety was formed to protect the settlers interests. Alexander Hamilton was a very prominent member of this committee. It was he, who, with a company of brave pioneers met on the West Branch of Pine Creek, ignorant of the great meeting being held in Continental Hall, Philadelphia. At this time some warm addresses were made and a set of resolutions drawn up proclaiming themselves independent of Great Britain. History quite often repeats itself, but very seldom is it contemporaneous with itself as it was in the case of the two groups of men proclaiming the same thing at the same time with about 200 miles between. This was indeed a coincidence. Alexander Hamilton wrote what is known as the Pine Creek Declaration of Independence, and the following 22 Fair Play Men, excluding himself, signed and approved it: Hugh White, Alexander Donaldson, John Clark, Adam Carson, Peter Pentz, Thomas Francis, James Crawford, John Pfou, Thomas Clark, Francis Clark, John Jackson, Philip Quiggle, Robert Love, Thomas Nichols, Samuel Horn, William Campbell, Henry McCracken, Simon Kurtz, Peter Grove, Hugh Nichols, Adam Dewitt, Robert Covenhoven. After all these men signed this declaration, they decided to send some one to Philadelphia to spread the news there and tell them that the people of this valley had declared themselves independent of Great Britain, and also to carry the Declaration with him to Continental Hall. A grandson of Michael Quiggley, the early settler, was to perform this task. He set out on his journey, and after having gone half of the way to Philadelphia, he met a man coming from Philadelphia, who was appointed by the delegates at Continental Hall to spread the news to all the settlers of the West Branch Valley that the colonists had declared their independence of Great Britain. To his surprise, Mr. Quiggley found that the same thing, on the same day, happened at Continental Hall, Philadelphia, and under the historic Elm Tree along Pine Creek. Realizing it was no use to travel any further, Mr. Quiggley and his companion made the rounds together through out the West Branch Valley spreading the news to all the settlers. A feeling of disapproval and hate constantly grew between the Indians and the white people. The proprietary forces of Great Britain saw how the settlers took the land from the Indians and continued to drive them out, and consequently had little trouble enlisting the savages on their side during the colonial dispute. A large price was paid to the Indian who brought in a settler’s scalp. In order to obtain money and get revenge. The Indians soon started plenty of trouble. Homes were burned and people were brutally murdered. Farmers who were harvesting their grain, or working around their homes were often attacked and scalped. The women and children were shown no mercy, and the death toll mounted. A few instances will be related to illustrate how hostile the Indians were to the white settlers. About May, 1778, John Hamilton, Robert Fleming, Robert Donaldson, and James McMichael set out in a canoe from Fort Antes to journey up to Fort Horn. The trip had gone nicely until they reached the mouth of Pine Creek. From a sink hole on the south side of the river appeared a party of Indians who opened fire and killed all but one, John Hamilton. Jumping from his canoe, and using it for a shield, he managed to reach the shore safely, and fled through bushes and over barrens to Fort Antes. The tragic death of Andrew Fleming is another instance of Indian cruelty. Fleming had settled at the mouth of Pine Creek. On Christmas Day, in 1778, he took his rifle and started out to hunt for deer. A report of a rifle fire was heard soon after, but his wife waited the entire day for his return. In the evening she started out to search for him, but had not gone far when she notice a small group of Indians some distance away partly concealed in the bushes. She returned to her neighbors for help and they found her husband, not far away from the house, shot dead through the eye and scalped. Such were the trials and horrors that the settlers put up with. They had to stand by or flee for their own safety while their loved ones and neighbors were being killed and scalped by these savage Indians. As conditions grew worse, Colonel Samuel Hunter of Fort Augusta, Sunbury, sent word to all the settlers and forts up river to evacuate and flee for their safety. This was the beginning of the Big Runaway. Alexander Hamilton and his two sons, Captain John and Captain Robert, were stationed at Fort Horn. On June 14, 1778, with all the inhabitants of the valley, they proceeded to Fort Augusta. When word reached Fort Horn every one was excited. They gathered together everything that would float—built rafts, collected all obtainable canoes, and even pig troughs to carry possessions down river. The women and children were placed on board the rafts and vessels while the men, well armed, marched down both sides of the river. They arrived at Fort Augusta without any attacks from the Indians. However, the women who were in charge of the vessels, had their troubles on the trip. When crafts hit a sand bar or the ground, they would jump out and push the craft into deeper water. This runaway was one of the saddest events of the American Revolution. The people had to run for their lives, leaving $200,000 worth of farm produce in the ground, ready to harvest. The settlers took along with them few possessions, among which was a chest made by Alexander Hamilton in the year 1774, a few years before the Big Runaway. The chest was carried down the river bank, lashed to two canoes, and filled with the finished product of forty bushels of wheat. It remained at Sunbury until 1784. According to the accounts of Captain Robert Hamilton, son of Alexander Hamilton, at the time of the Big Runaway, when the Hamiltons vacated their home, such excitement prevailed that the family left behind them quite a large amount of gold. Mrs. Hamilton hastened back to get it. She obtained the gold and was hurrying back to the river when a party of Indians attacked her a short distance from her home. She was scalped and left for dead. Strange to say, she was not dead, but in a serious condition, managed to reach the river where she was treated and restored to health. Upon their arrival at Sunbury, a silver plate was placed in her head and it remained there until her death, at the age of 95 years. As the years passed the settlers were more then busy with the twofold task of defending themselves against the Indians and the British. Those not engaged in the battles for freedom remained at home to defend Fort Augusta. Not long after the Big Runaway most of the Indians left the valley to attack Wyoming on July 3, 1778. Letters were sent to the Governor and the legislature by the people at Fort Augusta with the request that troopsbe assigned to this section of the West Branch Valley. With this assurance of protection the settlers began to return to resettle the land. A little trouble with the Indians continued to develop but not as before. In the fall of 1781 Alexander Hamilton was killed by the Indians, and his remains lie in an unknown grave. His wife, in 1784, returned by a special act of legislature with her eight sons and one daughter, and resettled the land they had formerly lived on. On their return they brought back the chest which had contained the flour on the Big Runaway. Robert Hamilton built a house for the family, and lifted the chest to the second floor with ropes before the floor was laid. It was used as a meal chest for 100 years until after the flood of 1889 when the property was purchased by the NYC Railroad, and the old home was abandoned. A hole was cut in the roof to remove the chest as the stairway was too narrow. The chest remains in the hands of Alexander Hamilton’s descendants today. In June, 1909, James Hamilton opened the Clinton Academy at Pine Creek. The school later burned down. During the third decade the first session of court in Clinton County was held, Feb. 16, 1839. Honorable Thomas Burnside was the presiding judge, with John Fleming and George Crawford as associates. Philip Krebs acted as clerk of the court. On Mr. Samuel Simmons’ farm along Pine Creek an Indian burial ground was found about 1840. It looked as though there had been a battle between two groups of Indians. Trenches had been dug and the bodies were thrown in and covered. Across the creek on Mr. Harvey Baily’s farm another burial ground was found, but these Indians were buried with care. On Mr. Simmons’ farm remains of an ancient circular fortification was found which resembled that at Circleville, Ohio. This farm is still owned by Mr. Simmons, but is at present (1939) being operated by Mr. Harry Bowers. The Rich family founded in this section by John Rich who was born in Wiltshire, England, October 16, 1786. A son of John Rich, he was a woolen carder by occupation. Mr. Rich purchased his partners interest at Plum Run and moved the machinery from Plum Run Mill in 1843 to the factory mills, which now comprise the Woolrich Clinton County Building, a fine brick structure, the first of its kind in Central Pennsylvania. The brick for the building had been burned on his farm. The Garman Lutheran Church at Pine Creek was organized in 1845 by an English Missionary, the Rev. F. A. Barnitz, of Harrisburg. The congregation began with a charter membership of 30, including the following: Henry and Hanna Garman, John and Mary Staver, Jacob and Sarah Hammersley, George and Elizabeth Lehman, Joseph and Rebecca Martin, Molly Kline, Heppy Kline, Rachel Fry, John and Sarah Knepling, Jacob and Sarah Kline, Catherine Esterline, Daniel Kline, John Yearick, John and Margaret Shiley, Mary Shiley, Michael and Catherine Wolf, Elizabeth Spong, John Bushey, Rebecca Myers, Mary Schaeffer, and Daniel Gise. A Sunday School was organized about the same time. Two miles west of Jersey Shore, Phelp’s Mills began operations in 1847 on Pine Creek. In two or three years a small village grew up. By 1856 a large saw mill was added for making boards, shingles, lath, palings, etc..
as the country was bring cleared and settled, Pine Creek Township bought one acre of ground in the year 1850 from Jackson J. Hamilton, and built a one room school house in an oak grove, and named it Oak Grove School No. 7, from which Oak Grove (Avis) got it’s name. The original building now stands at the extreme west end of Avis, just outside the borough line. During the period from 1861 to 1865 when the Civil War was going on, the following defenders from this section fought for what Lincoln believed to be essential—the preservation of the Union: Oscar Lowe, Joseph Martin, James Henry, W. J. J. Hamilton, Alexander K. Hamilton, Charles M. Hamilton, John J. Hamilton, Joseph Shaffer, John Shaw, Ferman Phillips, John Shultz, Thomas Gray, Francis Cox, Jirad Fisher, Joseph Bilby, Allonza Fowler, Charles McMechen. In 1868 additional land was donated by J. J. Hamilton for the Oak Grove School No. 7. In 1882 the right of ways were purchased for the Beech Creek Rail road, and the same was constructed from Jersey Shore to Clearfield in the following year. About the year 1896 the Beech Creek Railroad was taken over and operated by the NYC Railroad Company, which had come into possession of large tracts of coal land in Clearfield County. About the first day of July, 1897 residents of Oak Grove applied to the U.S. Post Office Department at Washington, D.C. for a post office. Calvin Smith, Joseph Martin, Jackson Hamilton carried mail from Charlton. Since there was another post office in Pennsylvania named Oak Grove, this post office was named Centre Oak. The location was in the store of Samuel Swartz at the west end of the borough. A.C. Noyes------------------------------------------------------ West Port, Clinton County, PA.
L.A. Mackey------------------------------------------------------------------- Lock Haven, PA.
James Gamble----------------------------------------------------------------- Jersey Shore, PA.
James a. Gamble, President---------------------------------------------------- Jersey Shore, PA.
F.T. Carpenter, Secretary-treasurer-------------------------------------------- Jersey Shore, PA.
Robert H. Lawshe, Superintendent--------------------------------------------- Jersey Shore, PA.
1800 - A tradition existed among the Indians that a great flood occurred in the Susquehanna at regular intervals of fourteen years, swelling the water six or seven feet above the average height of the freshets of the intermediate time. The fifth of these great floods took place in the spring of 1800, after a heavy rain, which continued three days and three nights, and carried off a tolerably clean snow. 1810 - Pumpkin flood occurred, raising the river six feet over its bank. 1814 - Sixth great flood in August; Caused much damage along stream. 1817 - This flood ought to be considered the first deviation from the early Indian tradition. 1828 - A flood should have occurred but did not. 1838 - Locusts appeared in June and remained for five weeks. 1847 - Water rose five or six feet above bank. rained hard for three days. Bank was full October, November, December. 1854 - Snow two feet deep. 1855 - Good sleighing. Locusts appeared June 7; remained four weeks. 1856 - Hard, cold winter, with much snow. 1857 - Good sleighing and cold all winter. 1861 - Flood over this side of the canal. 1862 - Good sleighing all winter. 1865 - Snow all winter. 1866 - Sleighing all winter, especially in December. 1867 - Snow deep, very cold. 1869 - Much rain in summer. Deep snow before Christmas. 1872 - Very cold winter. Locusts came June 11, stayed two weeks. 1873 - A great deal of snow. 1874 - Warm winter and wet summer. 1876 - Moderate winter, much fruit. 1878 - Moderate winter, warm spring, cold summer; river went over its banks. 1879 - Very cold in January. 1880 - Warm winter; cold, wet, backward spring. 1881 - Ice went out Feb. 11, very dry summer, no rain for 8 weeks, gardens dried up. There was little fruit. 1882 - Not much snow, river open all winter, backward spring. Snow fell on the sixth of May. 1883 - Moderate winter; river went over its banks. 1886 - A five foot flood; The canal broke at the bridge, and people were snowed in. 1887 - A beautiful Fall; The river was shut. 1889 - Moderate rain and high winds; Deepest flood ever known occurred this year. Water was ten feet in the houses. In 1907 the New York Central Railroad purchased tracts of land to locate their shops at their present position. This caused more people to make homes in this section. The following persons sold part of their holdings: George C. Shaw, J. Harris McKinney, John T. McKinney, Matthew Rogers, J.S. Hamilton, Matthew Ferguson, Abslom Fariel, Mrs. Nancy Smith, and George Crawford. In September of the same year, our nation was shocked by the tragic death of the President, William McKinley. His body passed through Pine Station on the Pennsylvania Railroad, enroute to Washington to lie in state. Later, Samuel Swartz opened a store on the west, and with the addition of a post office, which was named Centre Oak, mail service was started from Chatham Run with volunteer carriers. Beginning in 1902, when the Cochran Land Company of Williamsport was formed, the town of Avis took shape. Avis got its name from the daughter of J. Henry Cochran, president of the land company, and was originally situated south east of the railroad where South Avis is now located, but the town gradually grew westward where another land company was formed, known a the Oak Grove Land Co., with offices in the residence owned by Joseph Martin, but now in the possession of C.R. Kephart. The chief agent was C.H. Rich, of Woolrich, with Charles and John Crawford as his sub-agents. This company purchased land from Joseph Martin, George C. Smith, the Valentine Estate, William York’s Estate. W.J.J. Hamilton, Albert Rhinehart, and John Crider. The late Robert A. Shaw laid out a plot of ground on his farm and sold lots privately. Another land company, known as the Harris Land Co., was also formed with James Wentzel as agent. This same year, 1902, witnessed the first fourth of July celebration. A community picnic in the Avis Park, baseball games, and horse racing were the main attractions. Horses were furnished from Lock Haven and Jersey Shore, and foot races were held on the “boulevard”. The famous Repaz Band, founded by Daniel Repaz, from Williamsport, and considered the oldest band in the world, furnished music for the occasion. John Hazel, world’s greatest cornet player, who later toured the United States with John Sousa’s Band, accompanied the Repaz Band. In 1903 the first telegraph exchange, built by J.T. McGuire and later owned by the Avis Bank, was located on the corner of Highland and Shaw streets opposite the Bonner House. A millinery shop was opened by the Seyler sisters on Park street, in the building now owned and occupied by Alva Thomas. A few weeks later a jewelry store located at the present site of D.C. Baird’s store, was founded by David Samuel Shaffer. During the same year a water line was constructed by Jeffers (?) from Lock Haven, and a livery stable was started at the Royal Hotel grounds. 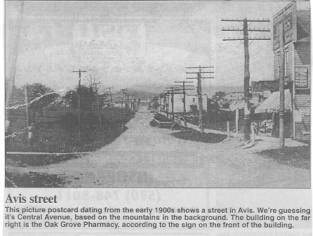 The first post office for the new community of Avis originated where the E.R. Robb building now stands. Mr. Francis Cox was post master. The Oak Grove Township School was founded at this time. Fraternal organizations, including the I.O.O.F, the P.O.S. of A., and the Red Men, were established, and held their meetings in the building belonging to D.C. Baird. This building was later destroyed by fire, and has since been replaced by another, housing the present grocery business of the former proprietor. The Oak Grove House, managed by Serf (?) Render, and later struck by lightning, sprang up across from the Bonner House. With the increased growth of population and new business establishments, an attempt was made to organize the first newspaper, called the Avis Advance. An office was opened on Central Avenue, in the building formerly used by David Love for his hardware store, and now used by the Christian Alliance Church. The paper consisted of 8 pages with 7 columns to the page, and was published every Friday morning. The publishing company consisted of T.E. Grady, president, who was publisher of the Montgomery Mirror; F.E. Hagenbach, secretary, who was principal of the W. Fallowfield school in Chester County, and also acted in the capacity of editor. Subscriptions for the paper were $1.00 per year in advance or $1.25 per year otherwise. Advertising rates furnished through applications, and no particular political party was favored. Mr. O.S. Williams, Canton, PA., was the first paid up subscriber. The burning of Mr. Brion’s store on the lot where George Reeder’s house now stands led to the organization of a volunteer fire company. Funds to build a hose house and secure a cart were supplied by a festival and soliciting through the efforts of the fire committee which consisted of G.C. Frank, A.I. Sweeley, and A. Johnsonbaugh. a citizen’s committee composed of D.C. Baird, John Bonner, and W.J.N. Cox, cooperated with the fire committee. The Avis Fire Co., No.1 was located in the Martin May building. The next fire building was located on a vacant lot across the street from Irvin’s Hardware store and later was again moved to the site of the Forrest Emerick’s garage. The first and only jail building was located in the same place. Business houses at this time were: J.T. McGuire, pioneer store; W.P. Dorman, grocery and racket store; J.P. Sylvis, shoemaker; D.C. Baird, bargain store; Oak Grove Pharmacy; Oak Grove Bottling Works; Harris Land Co.; Leo Earon, meat market; The Buffalo Clothing House; R.H. Meek, Doctor of Medicine; C.A. Brion; J.A. Guisewite; W.I.N. Cox; Getz and Sweeley, contractors; J.I. Brickley & Co., coal; Martin May, pioneer barber; Schaffer’s Drug Store; New Bonner House; O.K. Miller, stove and furnace work. The churches were the next to be built up: The Reform and Church of Christ; the Oak Grove M.E. Church, located on what used to be the farm of George C. Smith, on the corner of Fox and Grove streets where the Methodist Church stands today; the Episcopal Church, built by Senator Peal of Lock Haven, was located at the site of the present William Nichol’s home; the Lutheran Church was constructed on the Valentine Estate; and finally the Evangelical Church, likewise built on the Valentine Estate, where it still stands. A new industry, the cut glass works, was formed in the community in 1906. Mr. William Jones was the manager. An excellent quality of glass was made here, but the factory existed only two years. Two other establishments, The Bottling Wholesale store, and the Mayrun Candy store, moved into this territory and began a flourishing business. In 1907 the first graduating class of a two year high school finished its school career. The graduates were: Joyce Deise, Jean Bonnell, and Annabelle Rich. A little later a three year high school class was added, and the first graduating class consisted of two—Mary McKinney and Russell Stamm. The school, during this early period, was considerably lacking in space and equipment for handling all the students, so the Episcopal Chapel, and a log cabin, under the supervision of Reverend Grier, were made use of. During this same year, 1907, the Branch of Corning Glass Works, located here, and the following year a Glove Factory was established. On the fifth of May, 1908 the community of Avis was incorporated as a borough. Mr. Martin May, and a group of citizens interested in the progress of the town, decided to circulate a petition requesting the court make Avis a borough. All but two citizens signed the petition, which was presented at the may term of court under Judge Harry A. Hall, and the request was granted. Mr. Martin May was given permission to hold an election of borough officers on the eighth of June, 1908. The successful candidates took office the first of July, 1908, and served until the next regular election. Business houses continued to spring up. Mr. John Brungard built a meat market on Highland street; Edward Myers opened another meat market at “Doc” Williamson’s residence, which later changed into a bakery and was run by Samuel Brickley; and Mr. Pattoff opened a clothing store where the Legion Hall now stands. From 1909 to 1910 there was little building done, but in the latter part of 1910 the car department was added to the railroad shops, and this immediately stimulated another “big push” for Avis, which resulted in the following new establishments: the State Bank of Avis, George Bonner’s grocery, Reichard’s Bakery, Shank’s Variety Store, Robb’s Cash Store and Schroeder’s Barber Shop. Later, Mr. M.O.T. Sahm, who was then the post master, built another structure on Central Avenue, and moved the post office to the present site. The borough building and polls were moved to the present site of the Emerick building. The construction of storm sewers, and the opening of the first dentist’s office over the bank, with Dr. Manssury in charge, were additional marks of progress during 1910. The years between 1912 and 1917, though quiet and comparatively uneventful, were marked by the addition of the first five and ten cent store in 1912, the purchasing of the first automobile in 1914, a tin shop located on the present Miller estate and managed by O.K. Miller in the same year, and the opening of McCoy’s meat market in 1915. In 1916 four new rooms and additional teachers were added to the local school. The year 1917 saw the first improved road through Avis, and with the entry of the United States into World War, Avis contributed its full share of young men, of whom one remained in Flanders—Martin May Jr.. Following the World War, between the years 1918 to 1925, a new impetus for additional progress was manifested. The building formerly occupied by the glass factory was purchased by the borough for official use, and later a part was rented by the Rich Brothers, who started a shirt factory, and appointed P.H. Seyler manager. In 1919 another building was constructed for the factory, and with additional machinery a larger and improved industry took shape. In 1922 there were eleven teachers employed by the local school, and with an addition of four new rooms in 1925, the way was opened for an expansion of courses in the high school, resulting in a four year course. The latest edition, of four rooms, two of which were in the high school, led to the offering of manual training and home economics in the high school. The greatest disaster to the community occurred in 1928 when Frank Hoyer’s Lumber Yard and Gas station burned. A similar fate fell to Robb’s Poultry Farm in 1933. Beginning in 1930 when the nation wide depression gripped the country, Avis, like many other industrial communities, suffered in its drive toward progress. With the falling off of industrial activity many of the business establishments mentioned before have either disappeared or changed hands. However there has been marked evidence, in recent years, of a renewed interest in the community’s welfare through the construction of improved streets with W.P.A. assistance, the organization of the Boy Scouts and Camp Fire Girls, and the forming of a Community Club. These and many other similar organizations have caught the spirit of the early founders, and are striving for a bigger and better Avis.